Question: I have a bookcase and the shelves are sagging in the middle. The shelves are about 34 inches long. I am sure that it is the weight of the books over the years that have created the sag. Is there anything I can do to get them straight again, other than buying new shelves? Answer: Without actually seeing the bookcase, the shelves and the method the shelves are attached to the bookcase it is difficult to give you a definitive answer. I will however make a few suggestions; maybe one will be suitable for your situation. If the bookcase shelves are removable and are finished on both sides you could consider flipping the shelves. This will place the sag or bow on the top. The weight of the books when replaced may bring the shelves back to level. You can attach a batten to the underside of each shelf. 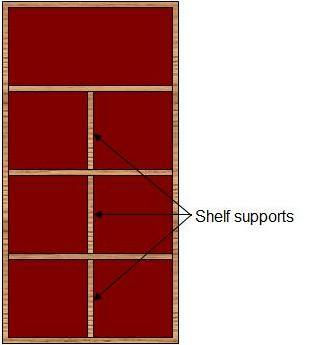 A batten is a small piece of lumber that runs the length of the shelf, as shown in Figure 1. A 1 X 2 board on its edge should be sufficient. Use screws and carpenter’s glue to fix the batten to the underside of the shelf. You can add a piece of lumber in the middle of the shelf that goes from the top of one shelf to the bottom of the shelf above it, as shown in Figure 2. This would force the shelves into position and reduce the shelf length from 34 inches to 17 inches. The shorter the shelf the less likely it will be for it to sag.